You can change the passwords for your management console and transaction center at any time; however, if you request a temporary password from either the management console or transaction center log in pages, you will be required to change the temporary password as soon as you log in. Enter your existing password in the box marked Existing Password. Enter your new password in the New Password and Confirm New Password boxes. Go to Security Settings Change Password. Management console passwords are not required to be updated unless you log in using a temporary password sent using the forgot password link. If you log in using a temporary password, you will be given a prompt to change your password as soon as you log in. Type your new password in the New Password and Confirm New Password Boxes and click the Submit button. Go to Global Options from the main screen of the management console. 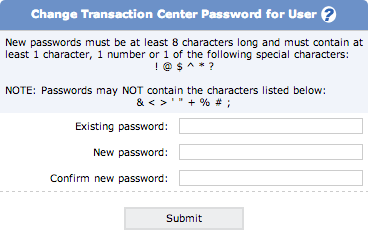 The option to set a new password is the first option on this page. Enter your new password in both the New Password and Verify New Password boxes.